While earthquakes centuries ago devastated properties around it in southern Sicily, Eremo Della Giubiliana miraculously escaped – and now a relaxing sense of seclusion and tranquility pervades the staircases and corridors of this delightful sandstone-walled palazzo. Add to that the friendliness of the property’s staff including general manager Angelo Di Fede, Margherita Gianni head receptionist, Lorenzo Floridia, receptionist, and talented chef Giorgio Ruggeri, and you have a wonderfully secluded retreat away from the stresses of modern life. Located near the town of Ragusa on rising ground granting fine views over the surrounding countryside, the Eremo Della Giubiliana stands amidst a series of interlinking pathways with garden areas divided by dry walls and scattered about with olive trees (oil from these trees is served with dinner, and is also used for soaps), Grecian urns and Washington palms. Hens, chickens, pheasants and other birds and domestic animals are housed elsewhere on the estate. So widespread is the property, it also grows other products, including beans, lentils, chickpeas, capers, cicerchia, wheat, almonds, marmalade, as well as drinks such as wonderful homemade Amaro and wine from Nero d’Avola grapes. Historical interest is enhanced by a fifth to eleventh century limestone necropolis on the grounds in which ceramic pottery, bronze jewels, necklaces, as well as seven ‘box’ tombs were found. The property was also home to Benedictine hermits who lived here while another interesting anthropological aspect relates to the Templars (made dramatically mysterious through ‘The Da Vinci Code’ novel and movie), particularly the group known as the Knights of Malta (KoM), which were encamped at Eremo Della Giubiliana for 30 years, after the monks left. So influential did the KoM become, it still has observational status at the United Nations (like Palestine) and operates within a Renaissance palazzo near Rome’s Spanish steps. It boasts having 120,000 members worldwide. This group owned the Eremo Della Giubiliana property until finally it came into the hands of Vincenza Jolanda Nifosi. Reached through imposing electronic gates and up a short driveway, Eremo Della Giubiliana’s reception area is a wood-ceilinged, limestone-walled affair, with partially carpeted black and gold marbled floors. An impressive set of 16th century Italian armor stands like a benign metallic servant at attention just inside the door, quite a surprise, especially if you happen to arrive late on a shadowy evening. Furnishings around the lobby are fascinating and include several old and tattered books, some dating back hundreds of years to the mid-1700s, including a history of the hospitallers, written histories of old maps of Sicily, a decorative wood and leather trunk you’d expect to find washed up onshore after a Spanish galleon wreck. Pencil and oil portraits bedeck the walls, their subjects ranging from city and seascapes to rustic countryside scenes to medieval portraits. A collection of colorful ceramic wine jugs stand in the corner of the floor while an intricately-ornate walnut cabinet houses liquors and wines. Soft, embroidered seats are scattered around the lobby providing plenty of room for leisurely conversation or reading. The property has 17 rooms and suites, as well as five cottages, located a short walk across the road outside the main gate. Located in open fields with a garden, a verandah and hedging as a privacy screen, the cottages offer a sense of peace and tranquility, interrupted only by the early morning chirrups of birds. Bicycles are provided for leisurely jaunts along the nearby pathways. Inside, decor is quite simple featuring a large central room, a bed in the middle and ample cupboards and side tables, with a ceiling of varnished oak. On one side wall of smooth bare limestone blocks was a welcoming fireplace. Separated from the bedroom, the bathroom was decorated with wall tiles in gay colors of blue and red, complete with a bathtub. 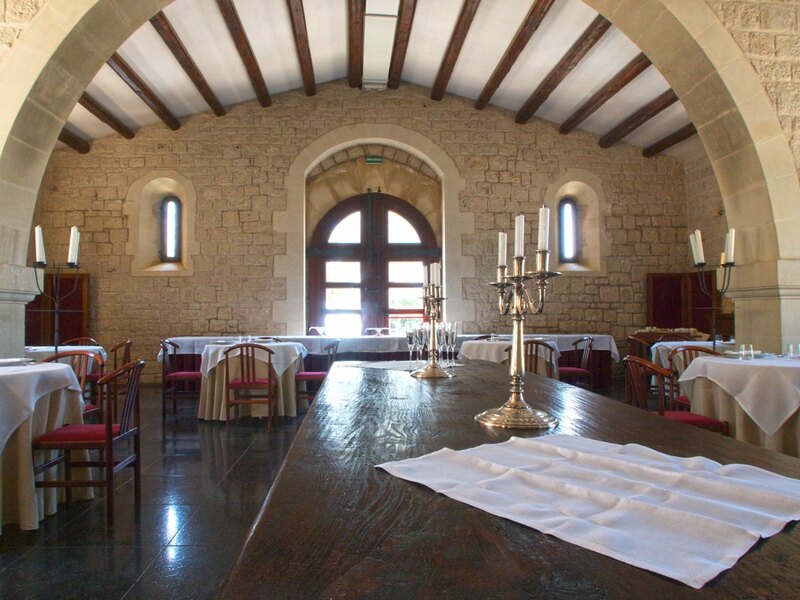 Dining in the property’s Don Eusebio Restaurant, named after the present owner’s grandfather, is nothing less than regal – under high-vaulted ceiling crisscrossed with varnished wood struts, limestone archways and a polished marble floor. Furnishings include framed ancient maps of Sicily and medieval oil paintings on the walls, candelabra, a piano, a cozy corner with soft, flower-motif sofas, two small bookcases and a table full of glossy photographic and historical books. A small bar and coffee corner stands beside some marble steps leading down into the restaurant. Veal modicano – with local mozzarella cheese from a farm 10 km away, topped off with poppy seeds, a large smear of rocket salad sauce and a separate one of golden olive oil; Marsala-flavored, Tagliolini pasta with rabbit and Modica (a nearby town) chocolate – a plate of sublime authenticity, combining native creativity with locally-sourced products – are just some of the dishes on the menu, with a strong emphasis on locally sourced produce. A sign beside the main electronic entrance gate Eremo Della Giubiliana stating, ‘Abatare la storia’ or ‘Live the history,’ captures the essence of this fine property and is a fair indication of what awaits guests here – an elegant retreat in a primarily Sicilian rural area shaped over the centuries by groups as varied as the Arabs, the Normans, the Spanish and the Knights Templars, complete with fine dining experiences. Posted in Luxury HotelsTagged Amaro, Angelo Di Fede, breakfast, chocolate, Eremo Della Giubiliana, Europe, farm, fine dining, gastronomic, Giorgio Ruggeri, gourmet, grapes, historical building, history, holiday, Italian armor, Italy, Knights of Malta, luxury accommodation, Margherita Gianni, Marsala, Modica, Nero d'Avola, olive oil, palazzo, pasta, pool, private airport, rabbit, Ragusa, restaurant, secluded retreat, Sicilian, Sicily, Tagliolini, Templars, travel, vacation, wine tasting, winery, winesBookmark the permalink.